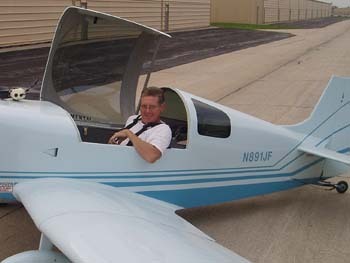 August 15 - One of our jobs when we returned to Omaha was to inspect the airplane I built and then sold to Steve. I'm sure you read about the deal we made on the airplane but it seems like it will work for both of us. As the builder of the airplane, I am also certified by the FAA to do the annual inspection on this airplane and only this airplane. I like their logic, who else would know more about it than me. 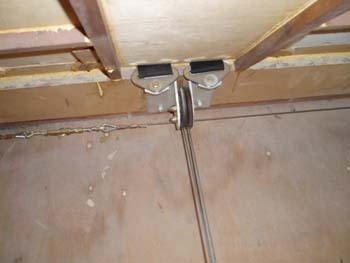 We did all of the standard things such as inspecting all of the cables as you can see below for wear and to ensure the stoppers were still installed. I like using the digital camera to help with this since I can blow it up quite a bit to see more than simply with my own eyes. Of course you have to rub all the cables to ensure there aren't any wires beginning to break either. 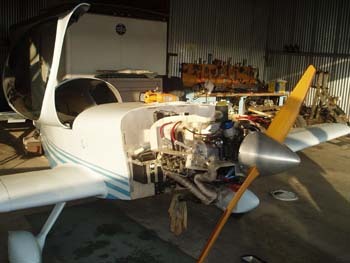 We also, changed oil, check brakes, air pressures, changed an oil pump, and more and more to ensure the plane is ready to fly again. After filling out the log book, I certified it ready to fly. We spent two mornings doing a great inspection and going over all of the systems again with Steve. Of course most mechanics would leave it there. Ready to fly so the owner would go fly it. 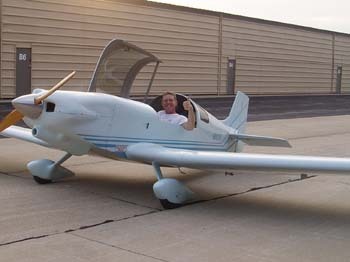 Since I built and flew it the first time, I still had my medical and I was current with my bi-annual flight review, then of course it was me that got to fly it for the first time after the inspection. You might be able to tell by the grin as I was putting on the four point seat belt that I was getting ready to have a great time. Below left you can see me on the takeoff roll. I was a bit nervous since I hadn't flown since I delivered this airplane to Omaha almost a year ago. However, after you strap this plane on, all of your hours of flying it come right back. It is truly like ridding a bicycle again. I flew around the pattern several times doing some turns and getting the plane up to speed in downwind traveling about 150 mph. 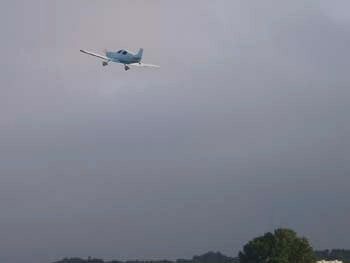 To the lower right you can see me on my missed approach to get used to slower speeds again before making my landing. My first landing went perfect and I only bounced a little from the rough runway. Overall, an excellent first flight. 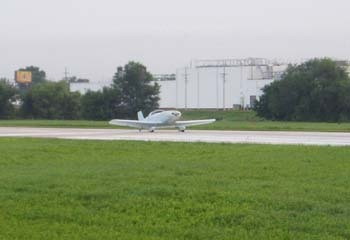 To the right is the grin and thumbs up of a successful first flight. Steve and I removed the top of the cowl and inspected everything again just for security and then put it back together. 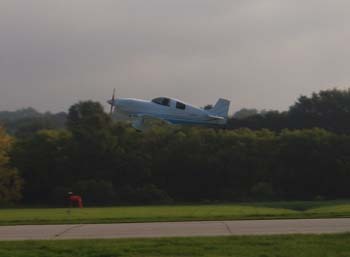 After putting on some additional fuel, I was going to go back up for another flight. This time I got a bit of a surprise. Lower left you can see me on takeoff and yes, that is my head you can see through the canopy. By the way, don't you love those rear windows? I designed them about 25 years ago now and I still think they look great. To the lower right you can see me climbing out but the clouds were coming in. It just happened that there were some low clouds coming in right towards the airport. 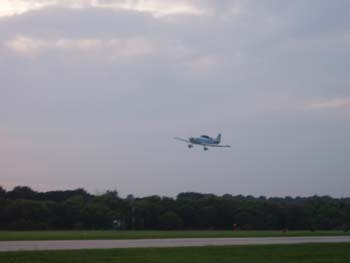 I quickly made crosswind, downwind, base and turned final and landed again just before the wind picked up a bit more. Overall a great second flight but too short. I may be flying again on Friday morning before flying commercial back to Norfolk, VA to get back on our boat. I have to tell you, there is no experience like flying an airplane you built yourself that can perform as well as my KR-2. This plane flys so well it is just amazing. I guess this was one of the first time people called me crazy for taking on a dream and accomplishing it. Of course the most recent time they thought we were crazy was when Deb and I decided to quit our jobs and go cruising. Both decisions sure have been good ones. Again, it is much more fun to be living our dreams than to simply dream about them. I'm not suggesting people make decisions to pursue their dreams haphazardly, but I am suggesting you should do what it takes to accomplish your dreams regardless of how long it takes. August 16 - 12,000 - Yes, we hit 12,000 hits on the website. Too cool. I was again completely humbled by everyone who has visited our website. I found in the last month talking to people that many of our visitors actually only check the site about once a week or even once every two weeks rather than my Aunt who checks it every day. (Thanks Aunt Sandy) In other words, we have more people who are enjoying our travels than we thought. All I can say is thank you for keeping me motivated to continue writing the website. As I post this, we will be back in Norfolk in 2 days. I must say that we have had the time of our lives living multiple dreams over the last month. Seeing family and friends, flying my airplane again, and of course performing in front of friends, family, and strangers that loved our music. Given the positives, we have been asked if we still want to go back to the boat? The bottom line is that we are still looking forward to getting back on the boat and continuing our cruising adventures. We are preparing to go to places that we have never been, rejoin cruisers who are now great friends, meet new people with experiences that we have never experienced, and enjoy each other in a life we had previously only dreamed was possible. We hope you are also looking forward to our adventures in this next year. Thank you to all of our website visitors and we hope you enjoy cruising with us. August 21 - WE ARE BACK - To quote a song. "Jeepers it is great to be back home. Home is where I want to be." We had a wonderful time with friends and family but it is great to be back to our boat. 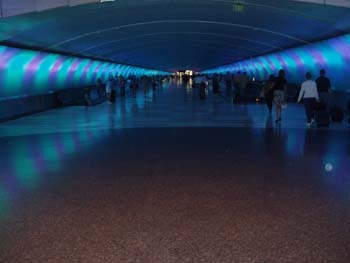 To make a short story shorter, our airline flights took us through Detroit and the tunnel reminded me of the movie E. T. The lights were flashing and I thought I could hear the theme song from the movie as we were moving through the tunnel. I didn't know if it was because of my recent flights in my experimental airplane or the future was looking at us and we would see space ships on our voyage back up the Chesapeake. We did have two good flights to get us back to Norfolk and truthfully we had mixed emotions. I know that you can't just live with family and friends forever and get the same response because after all we all stink after about 3 days and we overstayed that several times. However, we did have great times everywhere we went and didn't want it to end. At the same time, we do enjoy living our dream and in the end, all we needed was a taxi back to the boat. Fifteen dollars later, we found our boat exactly where it was supposed to be. I can't say enough about the people at Cobb's Marina. They did everything we agreed to and at the price they set from the beginning. It is just great to work with such reputable people. 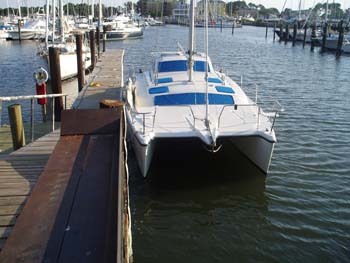 If you ever need work done on your boat and are in the Chesapeake, please consider Cobb's Marina and Boatyard. Peggy Cobb's is very honest and knowledgeable and will treat you right. As they would say in Missouri, she is honest folk. We took all of our luggage back on the boat, turned on the thru hull for the A/C and then connected shore power. Guess what? The A/C works perfectly. We then walked up to a nearby restaurant and got a little dinner even though it was 8:30 by the time we started walking. We were both hungry and needed a little exercise. 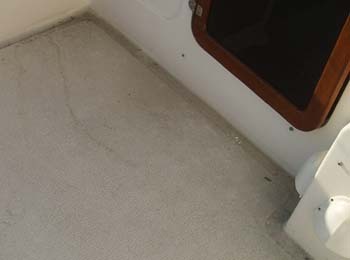 Of course when a boat is in a yard for 5 weeks it gets dirty. Ours was no exception. 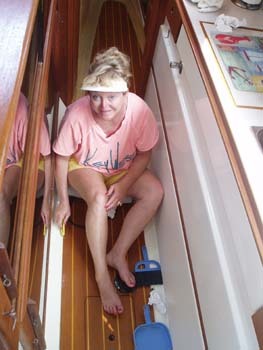 I spent the next day cleaning the outside of the boat while Deb started cleaning on the inside. In addition, we also started unpacking which was a chore in itself. We did make one quick trip to the grocery store to pick up a few things just to get started at re-provisioning the boat. We had turned on the refrigerator the night before and it was ready for the food that was starting to pour in. After we moved the boat to the T head of the dock, we just had to go out for dinner at our favorite "dive bar" across the bridge. So we used the bikes to make our way over. After all, just because I had gained 8 pounds "partying like a Rock Star" didn't mean I had to start my diet today. We got back and had a great night and enjoyed sleeping in our own bed. 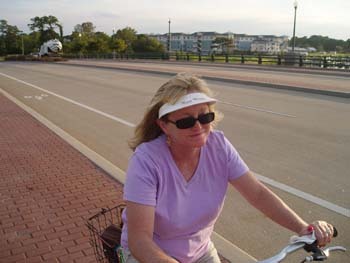 Deb always has such a serious face when she is riding the bike. I think that might be because she took a fall in the rocks as we were leaving the marina. She didn't get hurt too bad and as she always says, if she doesn't have a scrape on her when riding the bike, something must be going wrong. We of course needed to make multiple trips to the grocery store. Of course I knew the baskets on our bikes wouldn't be big enough so I took a big backpack too and filled it up . I always wonder what the load limit is on those small 20 inch tires. In addition to stocking up the "stores," we also made a run to Walgreens and washed the sheets. Now it looks like we are ready to go. 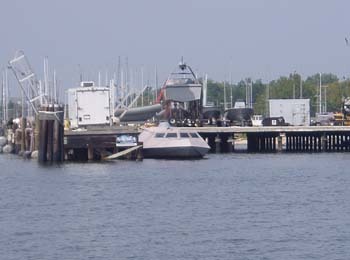 Tuesday, it appears we will be leaving about noon to move out of the marina and start our way up the James River towards Jamestown. It ends up I have some business to do with Peggy so I can build her a website for her Avian business. For the non bird people, that means a bird website. Peggy raises birds and already owns a domain name but didn't have a website. 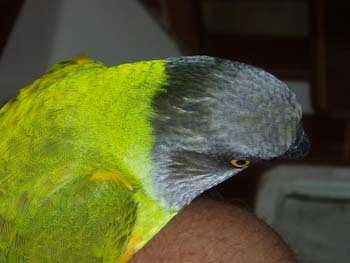 It seemed like a great exchange of services since she was the babysitter for our bird, Jimmy Buffett, while we were gone. By the way, Jimmy is doing great and was VERY happy to see us. Again, thanks to everyone at Cobb's Marina for your wonderful service and care for our boat while we were gone. August 24 - We left Cobb's Marina on Tuesday morning after I met with Peggy and helped her purchase her web hosting service. Of course it takes time to work through the system so we are still waiting for Dotster to send the email with access codes. 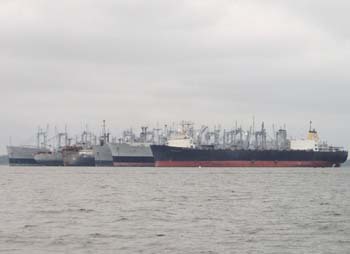 As soon as we were out of the harbor, we started encountering large ships again. 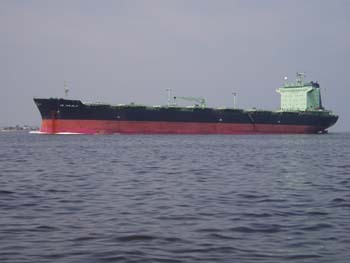 It doesn't take too many smarts to figure out that when a ship like this is coming down the channel, get out of the way! Below right, you can see the navy test area and I found the boat on the right to be interesting. We ended up anchoring in the area across from the naval station and it was perfectly suited for the wind conditions that were coming. Of course we ended up in a pretty big thunderstorm with good winds. 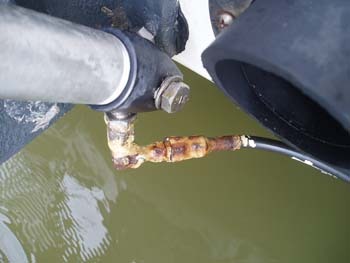 The anchor held fine and we didn't have any leaks so all is good. We arose the next morning and started up the James River. 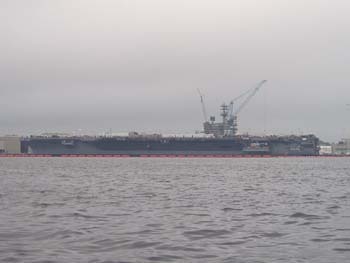 We passed Newport News and evidently this is a fairly large shipbuilding space. 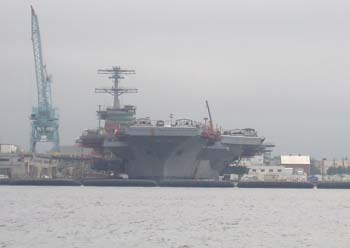 The ship to the left is an aircraft carrier and I don't know if it is a new one or if it is in for a re-fit or in homebuilding terms remodeling. 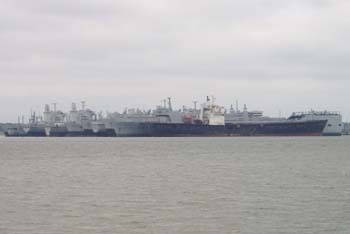 As we continued to move up the river, we encountered the anchorage for the navy's reserve fleet. Yes, there are a bunch of boats who are anchored up the river just in case they may someday be needed. As I was passing by, I was thinking it would be pretty cool to buy one. Then I thought again that I probably couldn't afford to paint one let alone run it. It probably costs more to simply start the engines than I spend in a year cruising. Oh well, I guess we can continue to dream about bigger boats but reality keeps us with our faithful Gemini. Above I took some more close-up pictures of the ships that were anchored in with the reserve fleet. 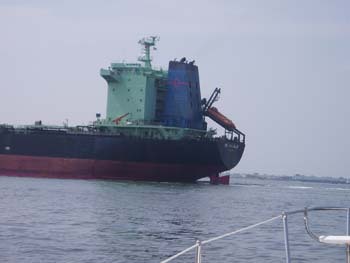 There are many ships that are unique. One in particular is in the center picture to the left hand side. It almost looks like two ships but instead it is one of the ships that fills will water so that you can load on a smaller boat or boats and then fill the hulls back up with air so they can be transported. 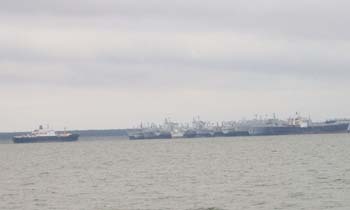 To the right, you can see another ship that was being built at Newport News. It just didn't fit in with the pictures above. 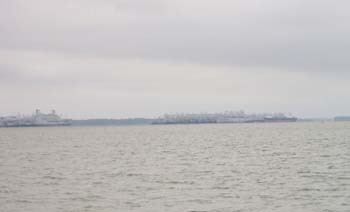 We are the only boat anchored in Jamestown. We are anchored above the ferry dock and every day watch the people in cars load onto a ferry and off they go to the other bank while the same thing happens on the other side. On Thursday we went to Jamestown Settlement. This is a "living history museum" and I must say that it is a wonderful place to engage people, especially children, into the history of the nation. 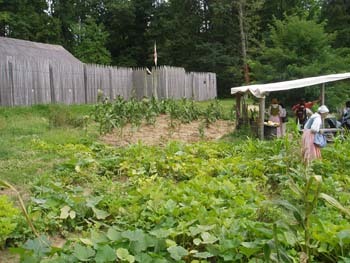 Jamestown is important in our history because this is the first English settlement in the New World. It isn't of course the first settlement because the Spanish claim that honor with their settlement in St. Augustine, Florida. 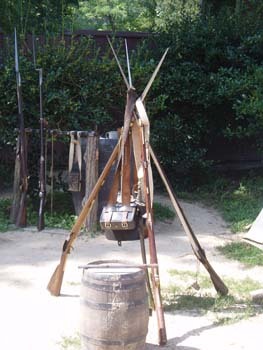 However, this just happens to be the 400th anniversary of the Jamestown Settlement and we are fortunate to benefit from the expenditures of upgrading the museum grounds for this anniversary. 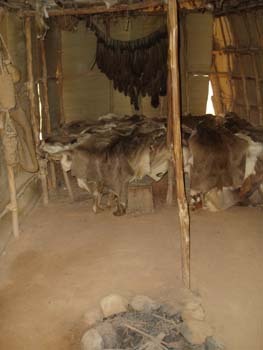 To the left and below you can see the inside of the huts constructed by the Powhatan Indians. 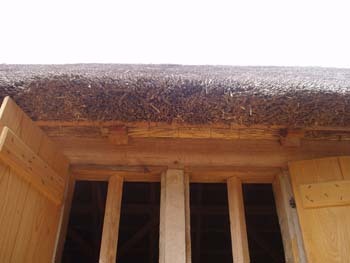 It is interesting because these Indians raised crops, hunted and fished so they didn't move frequently which meant they built semi-permanent structures. 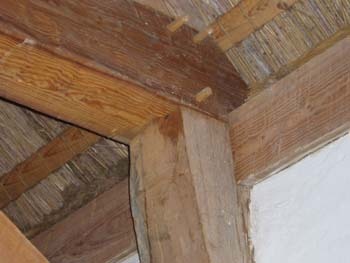 The structures were true to the era with the exception that they didn't make their own rope for the reproductions. 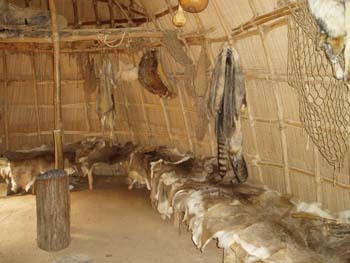 It was fun sitting on the deer skin seats/beds while trying to place ourselves into the era where the man was out hunting and fishing for the meat while the women were home growing crops, tanning hides, cooking, and making the clothes. 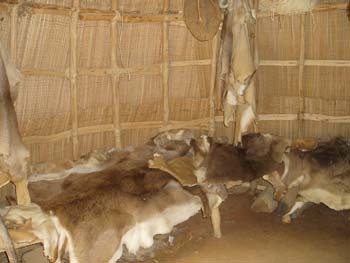 As a matter of fact, children didn't even have clothes in the Indian village until about age 11 because they were so hard to make. 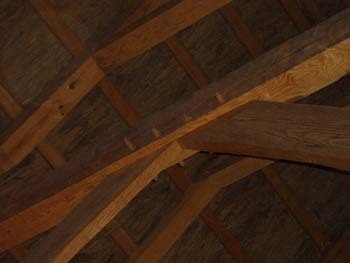 The picture to the right is of the roof of the church that was built as a replica at James Fort. You can see it is fairly thick and the thickness is what ultimately makes it waterproof. 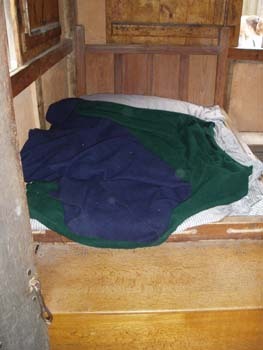 To the left you can see one of the beds which were used by the early settlers. There were only men and boys who came over first to settle the New World so they didn't necessarily get all the comforts of home. They were divided into units and typically there were 4 per unit. 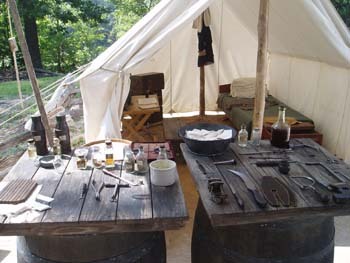 These slept 2 per bed and rotated the duties of cooking, washing, and "cleaning" besides their duties of watch keeping, working for the Virginia Trading Company who funded their expedition. They had to work 6 hours a day, stand their watch, and go to church 3 times a day in order to receive their benefits - food. 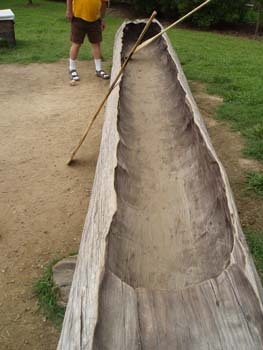 Below left you can see about the mid-point of a dugout canoe. Since this is a living museum, you might actually find them burning and scrapping the canoe when you move through the area. The middle picture shows one of the gardens which is being tended and harvested. They will actually have groups of children help to weed and water the garden. The picture to the lower right shows the route that was taken by the settlers. They had it figured out that the best way to the New World was by way of the trade winds. I doubt they understood that there was a perpetual high pressure system in the middle of the atlantic and of course the winds around the high move clockwise which is what causes the trade winds. Regardless, they knew the winds were always there so to come over they went south until the butter would melt and turned right. To return they went north and turned right again. Pretty easy don't you think? Of course it did take 144 days for the 144 men to arrive in the New World and the settlers had to ride with the cargo so for MANY days at a time they never left the close quarters down below. 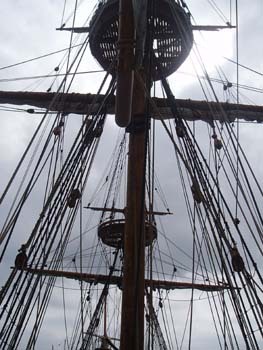 Speaking of the ships, to the right is a picture of the lines which represent the rigging for one of the ships. I forgot to take a picture of the outside of the ships but will tomorrow as we go back to shore. Below you can see some of the area below the ship.The left picture represents the area of the largest ship that contained the cannons for the fleet's protection. 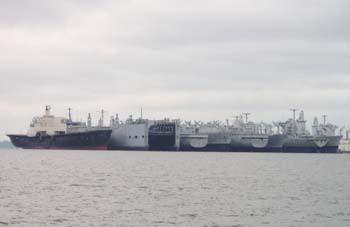 (3 ships in this fleet.) 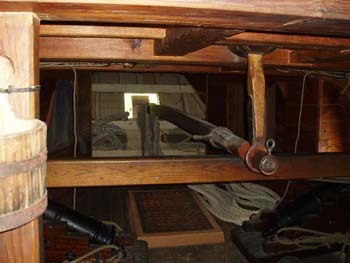 The picture in the middle is the rudder with the connection upwards which is a lever on a pivot so the helmsman above can steer the ship. I didn't ask but by just looking you can see that they can't be moving the rudder more than 10-15 degrees at the most. To say it would take a while to turn this ship would be an understatement. 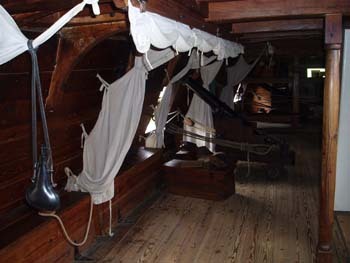 Below right is a picture of the Captains quarters. 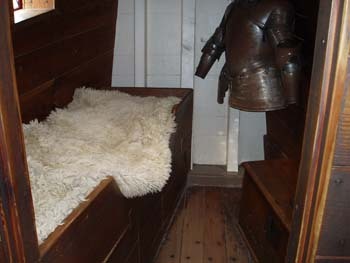 He had a nice bed, cover and of course a coat of arms. I sure hope he didn't wear that steel every day! I think I would have run down below and put it on if another ship was sighted or just leave it off all together. In addition to the outside area, they also have a wonderful set of galleries and a great movie about he times of these first settlers. This is a great spot to visit although we haven't found a place to re-provision the boat yet. We may as we explore the free shuttles tomorrow. Friday it was determined would be maintenance day and just a day to stay on the boat. We spent too much money already so we are trying to cut back a bit this month. With a 1,650 yard bill you can bet we've already exceeded our budget for the month so a little boat time will work great. 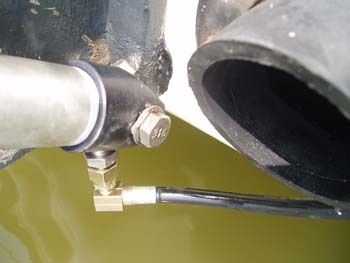 To the left you can see the connection from the high pressure line to the cylinder which raises the outdrive. Yep, it is a bit rusty. It had been coated with epoxy and painted but I've been wondering if and when it would fail. Today was the day. I have friends, Garry and Shirline, who say I'm one of the luckiest guys they know. Well, in this case, I'm both unlucky (it broke) and lucky (I have parts.) 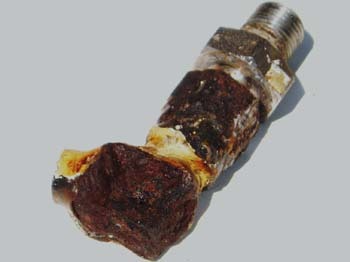 Yes, the previous owners were worried about this part and I had a new hose and fitting on board. All I have to do is get it all apart without breaking things and then fix it. Getting it apart wasn't the easiest because I had to cut apart the fitting you see to the left to get the stainless steel fitting out of the cylinder. Success and now after pulling out the old hose and installing a new hose, I had a new connection. After fitting up both ends, bleeding the system (into a cup - not the water) I was back in business!!! All worked great along with the typical frustrations of working in a dinghy worrying about dropping parts in the water. Below middle and right you can see the failing part. 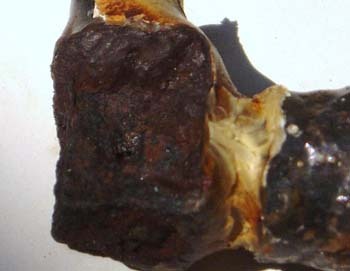 Corrosion is an awesome animal and this one ate and ate until it created the hole you see in the center of the middle picture. By the way, no I didn't know it was this bad or I would have already replaced it.... Anyway, right now I'm trying to save the stainless steel fitting at the upper part of the right picture in case I need it in another 10 years. I've already put more epoxy on the fitting that was mixed with cotton fibers otherwise know as flock. 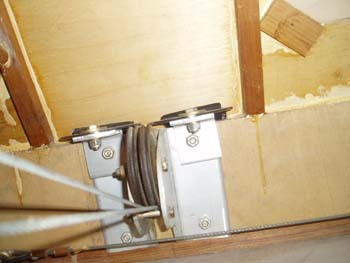 This makes a structural epoxy mix and it also doesn't run as bad. The purpose of doing this is to seal the new fitting you see in the picture to the above left and then I am going to paint it all so, hopefully, it is sealed against the saltwater causing the corrosion. While I was working outside, Deb was inside working on the areas between the woodwork on the floor and the fiberglass. The previous owners had put in silicone so dirt wouldn't get into the cracks. Over time, the silicone darkened and didn't look great. So, the only answer is to dig it out. I cut out the big pieces but when it comes to the detailed work inside, Deb is always better at this because she has more patience. We haven't decided yet if we will put some more silicone in the lower parts or not. Who knows, I guess we will decide someday. Of course we could always ask Jimmy Buffett who appears to be overseeing the project but I haven't taught him the word silicone yet so I'm not sure he can be of much help. I also replaced the speed/temperature sender in the starboard hull this afternoon. You can read about the part numbers and such on our maintenance page if you just have to see the details. 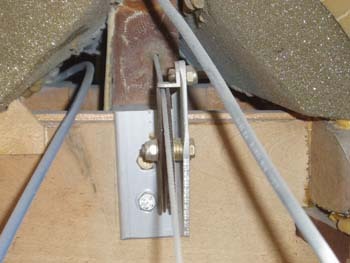 Great thing though because I was able to splice it in and everything worked. I love it when a plan or should I say a project comes together. 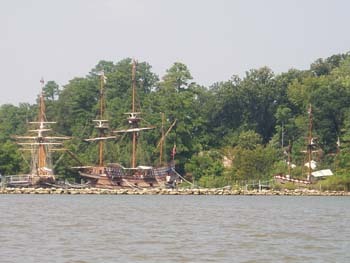 To the right are the ships Susan Constant, Godspeed and Discovery who set sail from London on December 20, 1606, bound for Virginia. The ships carried 105 passengers and 39 crew members on their four-month transatlantic voyage. I have to tell you, that I went below on these ships and knowing the passengers were "cargo" and they didn't have free reign of the ship, this was a tough voyage. First, it was a good thing they were going downwind. I'm not too sure how they would do going to the weather. The second thing is that when I am sick, I want to throw up outside and not down below with everyone else. The main reason is that I don't want all of them getting sick too which happens when you smell someone else getting sick. Lastly, I just have to say that I just hope that we as a country can fulfill the dreams of all of the people who died just to give us the chance to live in this new world. They gave up everything in order that they could come to this country. I wonder if we would do the same given the circumstances they had to travel under? And so it was as we began our historical tour through the Yorktown Victory Center. As we walked down the path to visit the galleries, we encountered the historical timeline and many of the historical statements which shaped our new world. The landowners felt as if they were slaves for England as these words were written. I have come to wonder why they didn't figure out that their future creation of slave laws and ownership of slaves didn't contradict their own words. Regardless, the country finally caught up and all people within this country are free to become the best that they can be. As we toured the troop encampment, we found the operating room. I remember watching Master and Commander when they were operating on the person's head. The doctor cut a hole in his head, by the way the tool is on the upper right hand side of the bench next to the bottle, and then dipped out some of the infection. After which he then sealed the opening with a coin that of course wasn't sterilized before applying it. Looking at these instruments laid out on the bench, I was pretty happy that my operations have occurred in a bit nicer place. At the same time, I also wonder what they will say in another 200 (not 400) years when they look back at the way we do medicine today. I think the progress we will make will be staggering and it would actually be pretty cool to stand in the future and envision what can and will be done. We actually showed up in time for the cannon firing demonstration. Since this is an interactive display, there were actual characters and a great leader getting audience participation. Not only did they ask quite a few questions to the audience, they also involved the kids and the parents in the preparations of the cannon. 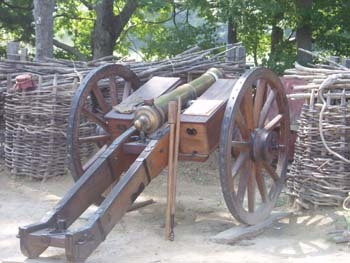 We didn't stick around for the actual firing since we've seen quite a few cannons fired on our journey. You might remember they fired one every half hour in St. Augustine right above our boat. Regardless, it was really great the way they involved everyone. 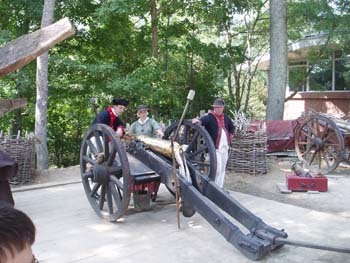 Below you can see some of the guns that are prepared for the battle that was to come. Ultimately, the French joined the battle with their warships coming into the Chesapeake and Washington learning of this moved his troops so he could assault Cornwallis whereupon Washington attacked and secured the English surrender of his 7,000 troops on October 17, 1781. The final Treaty of Paris in 1783 granted a clear-cut recognition of independence. 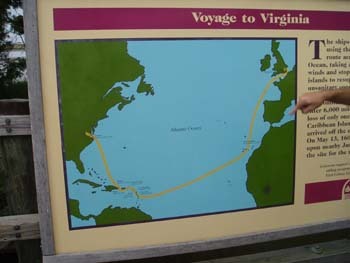 So, after our visit to Jamestown, Williamsburg, and Yorktown, we have revisited our 5th grade history once again. Also, I must admit, I am not as smart as a 5th grader as a knock off of a current TV show. Regardless, we enjoyed the visit and decided that we should be making our way back south and on to our next stop. We elected to go to Smithfield, VA which was in several of the brochures. We needed some supplies and from the looks of the brochures, we were going to find a very friendly town. However, I forgot about my simple truth of marinas. Town docks are the emissaries to the town - friendly to all boaters and private docks are there to make a profit and protect their clients interest. Since this was a private dock, we found the following interaction to pretty much say it all. We took our dinghy to Smithfield Station only to find that we needed to pay $25 just to tie up our 10 foot dinghy. I started negotiation and found that I could park the dinghy for 24 hours and could then use the pool by paying the $1.75 per foot fee and then it would only be $17.50. As I was about to walk out, the lady said "are you thinking about having lunch?" I said, "we were." She said, "then it would be free to park the dinghy and then you could keep it there and go to the store.." Ok, I may be dense but I'm buying lunch! Following lunch we can ride the 2-3 miles to the grocery store. 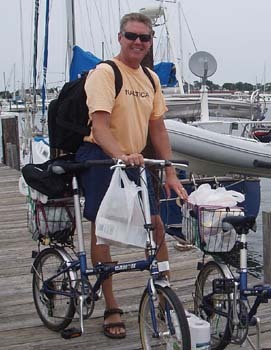 We returned to the boat, picked up the bikes and then went back for our lunch and ride to the store. Tomorrow we will start back up the Chesapeake and on to other adventures. I can't wait to see how much it will cost us to "land our dinghy" at the next stop.